Until recently being eclipsed by Holly McPeak, Kirby had won more event titles (67) than any other women on the pro beach circuits. Her 29 wins, including 26 domestic titles, with Liz Masakayan was also a team record until being eclipsed by Shelda Bede and Adriana Behar. Kirby was the WPVA�s Most Valuable Player in 1990, 1991 and 1994, co-MVP in 1993, Top Offensive Player in 1990, Best Setter in 1991, 1993, 1994, 1995 and 1996, and Best Hitter in 1992. 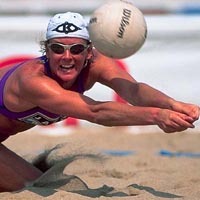 Kirby has played professionally in Europe and competed on the Major League Volleyball circuit (1986 and 1987). Kirby attended both Utah State (1979-82) and Kentucky (1983-84) where she played volleyball. Kirby was a first-team All-America in 1981 at Utah State and 1983 at Kentucky. Kirby was the SEC's Most Valuable Player in 1983. Kirby was honored by SHAPE MAGAZINE in 1992 as one of the nations' 10 fittest people.